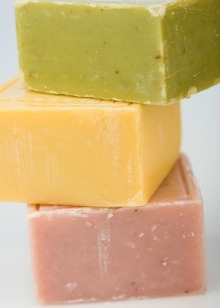 Homemade soap recipes are proved below for those interested in making their own soaps. Homemade soap recipes are a great way of introducing all natural ingredients that are good for your skin into your cleansing soap. 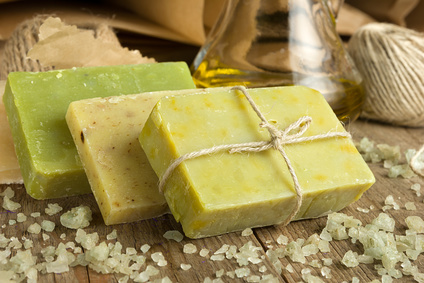 Below are many natural soap recipes that you can make at home. These handmade soap recipes are gaining in popularity due to the fact that people want pure skin care products. They do not want their skin to come in contact with the harsh ingredients and perfumes that exist in the many skin care products available today. By using homemade soap recipes, individuals can choose which ingredients they want to add to their cleansing soap. Assemble the ingredients listed below. Mix the ingredients into the melted soap and water mixture. Using an electric mixer, whip the soap until it has doubled in volume. Spoon the soap into the prepared molds, pushing it into the molds as best you can (the beating action cools the mix, so work quickly). If the mixture has cooled off and thickened so much you cannot put it into the molds, hand mold the soap into large balls. The following ingredients are required for this cold cream soap. Try making this delicious sounding soap. Melt the MP soap. Remove from heat and slowly stir in the cocoa butter and enough cocoa powder to make it a pale brown or tan in color. Add the chocolate fragrance oil. Reserve enough of the soap to make a darker brown color. Pour the lighter shade of brown soap into round/cookie molds. Add more cocoa powder to the reserved batch of MP base to make a darker brown. Marble into the pale brown soap. Melt the MP soap base. Remove from heat and stir in the cinnamon oil and coloring until well mixed. Pour the soap into a mold and let it set for three hours. The ingredient list for this citrus homemade soap recipe. Melt the soap base and at the same time melt the shea butter in a custard cup placed in a pan of boiling water or in the microwave. Add calendula petals to the melted base, a few drops of yellow food coloring, the essential oils and then the melted shea butter. Try to have this the same temp as the melt and pour. Keep stirring the soap/shea butter mixture as it cools. As it starts to set up spoon into heart molds. By spooning you have more control of how many of the calendula leaves go into each mold. Set at room temp until they are skimmed over fairly firm then chill them in the freezer for about a half hour before removing from the mold. Place them on a rack to finish drying completely. Try to make this recipe with the following ingredients. For this homemade soap recipe, melt the soap and remove from heat. Add the orange oil and food coloring, stirring until well mixed. Pour half of the mixture into each soap mold and let it set for on hour. When the orange soap has set, melt the second half of MP base. Remove from heat and stir in the whipping cream and the vanilla fragrance oil. Pour the melted soap into the molds on top of the orange soap. Let it set for three hours. Your finished bars should come out half orange and half white. Enough for 2 bars. Shred the soap in a food processor and set aside. Boil 1/2 cup of water over low heat and stir in the shredded soap. Continue stirring until the mixture becomes a sticky mass. It should take approximately four minutes. Remove from heat and stir in the aloe vera gel, the fragrance oil and the coloring until well blended. Spoon the mixture into a mold and let set for six hours or until hardened. Wrap finished soaps in cellophane. Soap recipes are provided by Healthy-skincare.com in an inexpensive ebook which contains hundreds of homemade soap making recipes. These recipes are very popular with individuals interested in healthy skin care because you can produce natural soaps that are customized to your skin type, skin condition or skin problem, or simply to make a soap that suites your own personal preferences. With over 500 homemade soap recipes to make your own soap, you can definitely find a recipe that is perfect for you and your needs. Avoid the use of store bought soaps that contain cheap perfume or harsh artificial ingredients. Making your own soap allows you to select which ingredients go into your soap. For those with sensitive skin, these natural recipes are ideal because you can avoid the ingredients that trigger a skin rash or other skin reaction. and many more homemade recipes for all of your skin care need. This ebook of over 500 homemade soap recipes and other skin care product recipes is available from Healthy Skin Care for purchase by clicking on the Paypal link below for only $4.99 US funds.